Metal detection, including iron by phone is real and not superstitious as some believe, so there are many applications available on the Google metal detector, but I chose you the best and most famous is the application of Metal Detector. 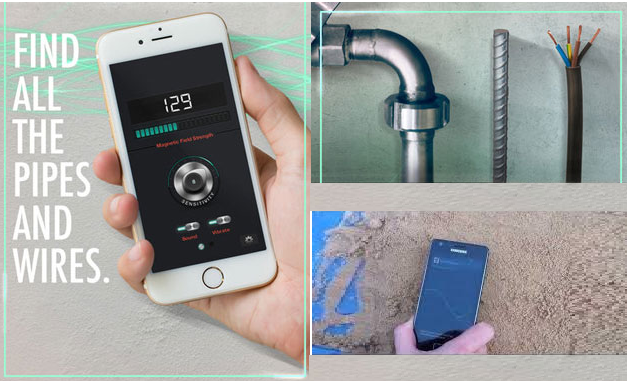 The application of Metal Detector allows users of Android and iPhone devices to turn the phone into a metal detector, a very sensitive application of the pieces of iron and is what you need the compass of the smartphone to determine the parties correctly. With this application you can find the electrical wiring in the walls and iron pipes in the ground and the method of using the plaster is simple just open the application and move it around where you want to find the minerals and then notice the height and decline of the indicator and the greater the percentage of the field, there is a metal in this place. - Helps workers, engineers or household uses and find hidden wires inside the walls. - Locate the iron in the wall to determine the location of the addition of electrical outlets. The application provides 3 different colors according to your approach to the metal. The closer you go when the color of the signal changes, the green indicates that the device has not found the metal, the red indicates that the phone has detected the metal.